Curly Moon Crafts: JLO - Coffee Lovers - What's Brewing? Hi Friends: The Coffee Lovers Blog Hop is still in full swing with lots of great coffee-themed cards! JessicaLynnOriginal stamps is one of the sponsors for the hop - here's my card featuring this cute Brentwood Coffee Lovers Summer 2017 #2 digital stamp available on the website. Visit all of my design teammates and see what they've done with this fun stamp set. Print image onto smooth white cardstock and color with Spectrum Noir markers. Cut the focal image with the pierced square dies, then add glossy accents to beaks and eyes. Cut square panel to frame the focal image. Cut and ink edges of patterned papers, then add to square card base. Cut slit for the latch tab. Stamp sentiment onto tab with black ink. Add baker's twine around card, then use foam squares to add the focal image. Finish with some gems on the flowers and along edges of the card base. awesome coffee card love that his mug is him. So fun, love him teamed up with the fantastic flip flop paper! 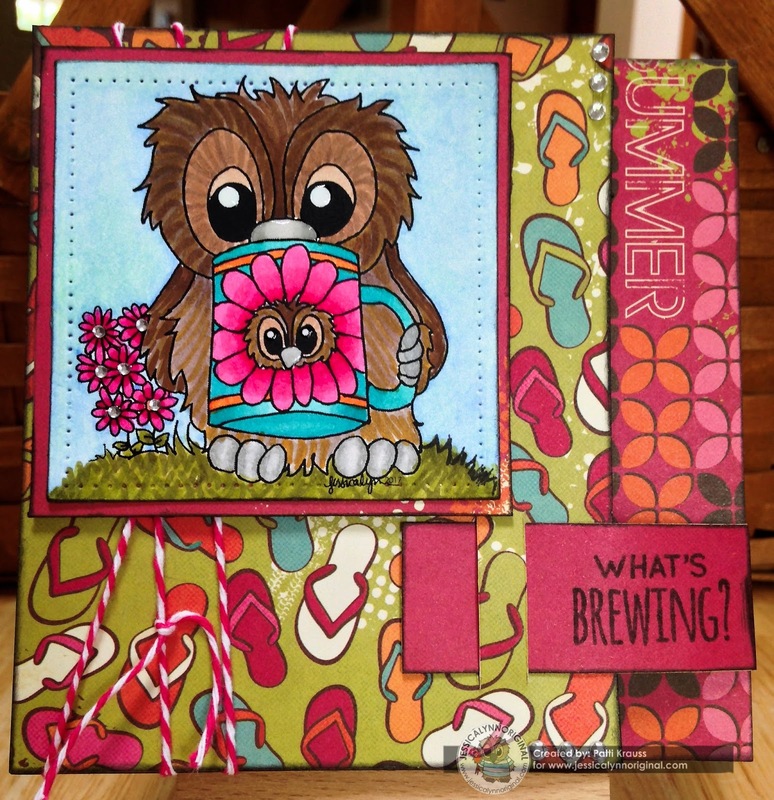 The flip flops in the background make this a awesome summery card, great colouring to! Being a Florida girl, I am loving those flip flops! Very pretty with all the happy colors! That certainly is a bright and bold summery card design. Cute too! Patti, this is totally adorable and what great design paper! LOVE this! From that awesome flip flop paper to the great colors you used for him and his cup... awesome!